The digitization and globalization of medical information is overwhelming traditional medical practices. Physicians confront a continuous avalanche of medical discoveries on disease origins, symptoms and treatments. 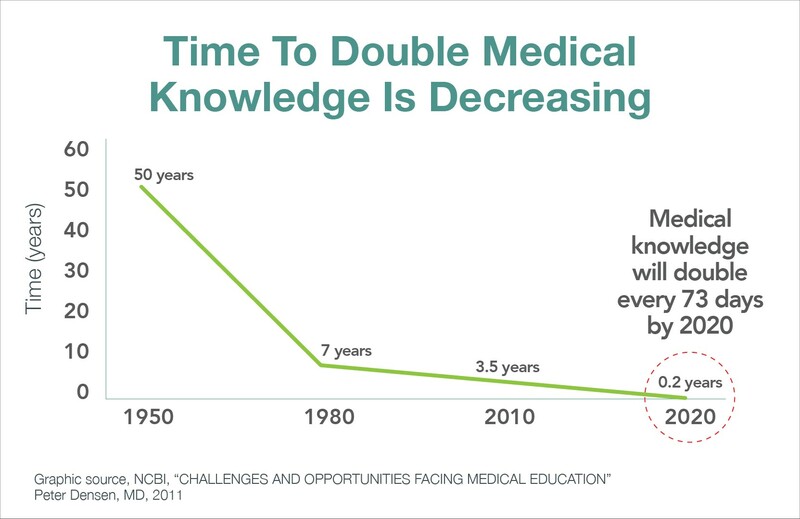 By 2020, medical knowledge will double every 73 days. Fairly or not, doctors carry a “know-it-all” reputation. Uneven power dynamics shape physician-patient engagement. Doctors still interrupt patients early and often during consultations. Many patients grant doctors all-knowing status and blindly follow their advice. In reaction to this paternalistic “doctor-knows-best” image, some physicians swing to the other extreme. Confronting patients well-armed by Dr. Google, they become “doctors-informative,” detailing patients’ treatment options without insight or clear direction. Neither approach works well. Inadequate doctor-patient communications often result in patients not understanding their diagnosis and/or their treatment regimens. Doctors confront a stark choice. Their natural instincts are to run ever faster on the information treadmill to keep practices current and patients happy. This rarely works and contributes to physician burnout. The rational alternative requires doctors to “let go” of being all-knowing and informative. While hard to do, physicians must acknowledge their cognitive limitations, rely on machine-based diagnostic tools and guide patients in shared medical decision making. In this brave new medical world, data flows into knowledge networks that standardize, monitor and enhance care protocols. Doctors will navigate voluminous data flows in concert with their patients. With the assistance of artificial intelligence and the benefit of more quality time with patients, they can provide the right care in the right way. To realize the full benefits of knowledge networks, doctors must embrace an approach to care that acknowledges patient concerns, priorities and insights. Engaging patients in this way generates better, more personalized care outcomes. In January 2009, John Hegel III, John Seely Brown and Lang Davison published a seminal Harvard Business Review article titled “Abandon Stocks, Embrace Flows.” Contrasting historic and current methods of knowledge creation and dissemination, the authors suggest an operating framework for achieving success in hyper-digitized professions like medicine. Their “solutions” run contrary to entrenched professional instincts, business models and practices. Historically, firms have acquired and defended “stocks of knowledge” with the goal of renting expertise to companies needing their products or services. Law firms, accounting firms, investment banks and businesses that rely on R&D fit that bill. They apply regulations, patents, licensing agreements and contracting mechanics to protect hard-earned intellectual property. In line with this traditional knowledge economy business model, individuals spend their formative years in structured educational programs to develop marketable skills. While all professionals gain incremental expertise through work, almost all leverage their already-acquired “knowledge stocks” as they progress through their careers. Intellectual property protections become less enforceable. Here’s the rub. In a connected world, knowledge exchange must be collaborative, reciprocal and ongoing to avoid stagnation and subpar business offerings. Value accrues to those who participate willingly, collaboratively and freely in the “knowledge flow” economy. “Free-riding” offers short-term reward but forgoes the longer-term benefits of value-creating knowledge exchange. As the authors note, “Knowledge flows tend to concentrate among participants who are sharing with, and learning from, each other.” Remaining relevant requires ongoing engagement. For healthcare companies this runs contrary to entrenched professional instincts, business models and practices. The desire to contain and defend stocks of knowledge dominates. This impedes the kind of care coordination and shared decision making that optimizes quality, efficiency and innovation. Today’s healthcare consumers willingly participate in knowledge flows. Use of wearable devices quadrupled since 2014 (from 9% to 33%). Use of digital health apps tripled during the same time (from 16% to 48%). Consumers increasingly access their digital health records, particularly to review lab test results and physician notes. Consumers show almost universal willingness (88%-90%) to share personal data with healthcare professionals. Consumers show more willingness to share personal data with insurance companies (72%) and online communities (47%) than with government agencies (41%) and employers (38%). Consumers have high satisfaction (74%) with virtual care. Nearly half of consumers (47%) prefer immediate virtual care to delayed in-person care, expressing appreciation for virtual care’s convenience and low costs. Consumers are accepting of and willing to receive artificial intelligence (AI)-related healthcare services. Driven by experience outside of healthcare, consumers increasingly expect to use digital technologies to control when, where and how they receive care services. By harnessing digital technologies in this way, healthcare will increasingly tap digital technologies to empower human judgement, free-up clinician time and personalize care services to put control in the patients’ hands. Just as blood doesn’t flow through clogged arteries, data doesn’t flow through disconnected portals. Data wants to flow and be free. It must be interoperable, not inaccessible. Organizations that restrict data access operate under the false assumption that stockpiling, hoarding and protecting knowledge enhances their value to society. Consumers want their health data to flow through systems that offer easier access, refined diagnosis and guided treatment and support. The value of interactive knowledge exchange will increase as AI shapes care delivery. A 2016 study by Frost & Sullivan projects healthcare’s AI expenditure will increase 10-fold between 2014 and 2021, from $634 million to $6.6 billion. As it grows, the study’s authors believe AI could improve health outcomes by 30-40% while reducing costs by up to 50%. Digitization of healthcare data is simultaneously transforming and disrupting traditional healthcare delivery practices and business models. Virtual care tools increasingly provide the “know what” content for effective delivery. Not requiring encyclopedic medical knowledge frees doctors and other caregivers to develop their “know how” and build trusting relationships with patients. Supported by AI and virtual care tools, collaborative problem solving and shared medical decision making between providers and patients will redefine healthcare delivery. Great service and fair prices are the American way. Healthcare’s deep structural defects fragment healthcare delivery, distort buyer-seller relationships and diminish accountability. Digitization, consumerism and value-based payment models challenge the sustainability of incumbent business practice. All Americans to lead healthier, more productive, interconnected and happier lives. As knowledge flows and networks redefine healthcare delivery, competitive advantage shifts to individuals and organizations willing to share information rather than hoard it. Open knowledge exchange will proliferate. Closed systems will wither. This is a welcome development for American society, its people and its economy. Healthcare should spur American progress, not limit it. Our national goal should be to create a healthcare system that delivers accessible, superior care to all for reasonable prices. Unleashing America’s innovation engine on healthcare’s inefficiencies can create a personalized system that helps doctors and patients make the best decisions together. When outcomes matter, customers count and value rules, great healthcare is inevitable.